It’s Sunday evening, and I haven’t had a chance to blog this week, so I thought I would share a few things that have caught my eye recently. I am trying really hard to resist the urge to buy the ‘wants’ and stick to the ‘needs’ at the moment. I do have a few holes in my wardrobe (a pair of boots that aren’t black, a winter dress, a new pair of white leather trainers) so I am trying to focus on filling those, but there is a lot of temptation about! 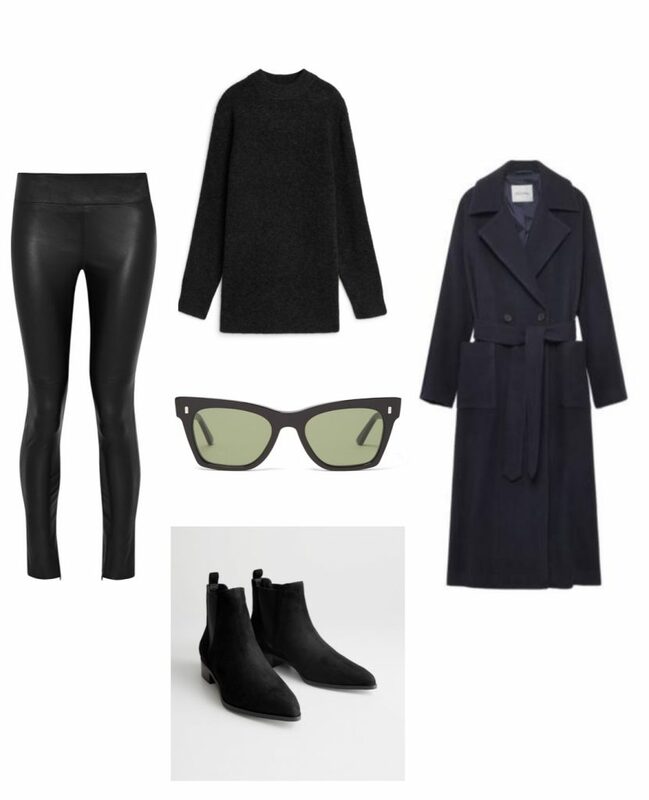 Leather leggings are a winter staple for me and I have heard such good things about these from Iris and Ink at the Outnet. Worth a try if you are looking to invest. 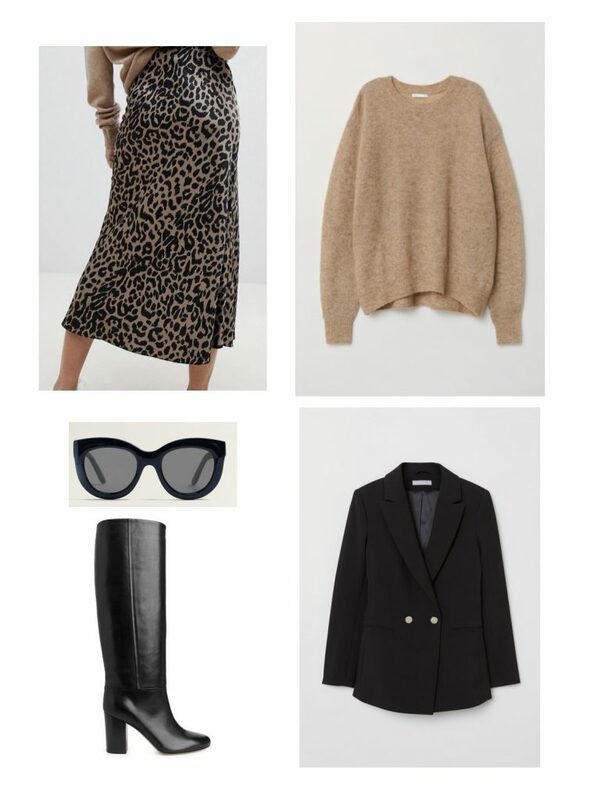 I really love pairing navy and black and spotted this bargain (70% off) American Vintage coat at Brand Alley. If you are still looking for a pair of classic chelsea boots, then you cannot beat these from &Otherstories. I tried them on yesterday in the brown and they are so comfortable. I’ve had a bee in my bonnet about a cream knitted dress this week. Having tried on a few, I realised that cream knitted dresses show lumps and bumps you never even knew were there! But I still love the idea of a knitted dress, and this burgundy version ticks all the boxes. 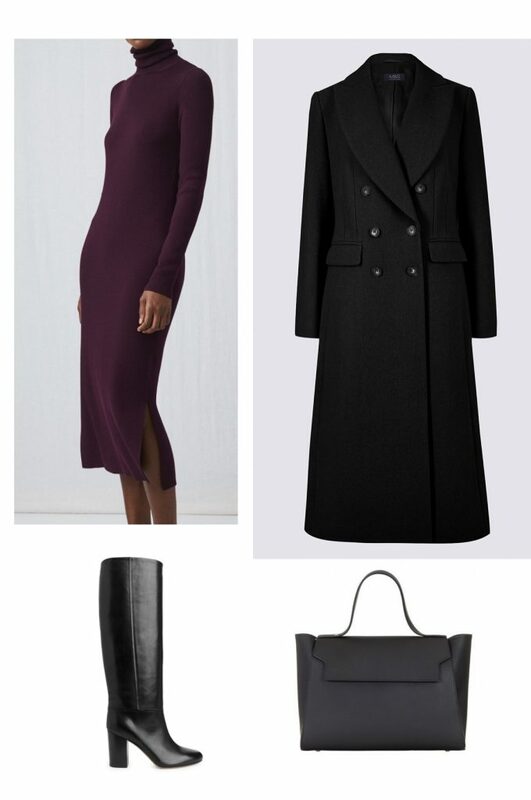 Merino, a beautiful shade for Autumn/Winter and it looks like the perfect length (below the knee) If you are looking for a pair of classic black boots these are expensive but look absolutely beautiful and you will wear them for EVER. I love a boot without zips, they just look much more expensive and elegant. I have the Cara bag in burgundy and I love it. I am so tempted by this skirt. 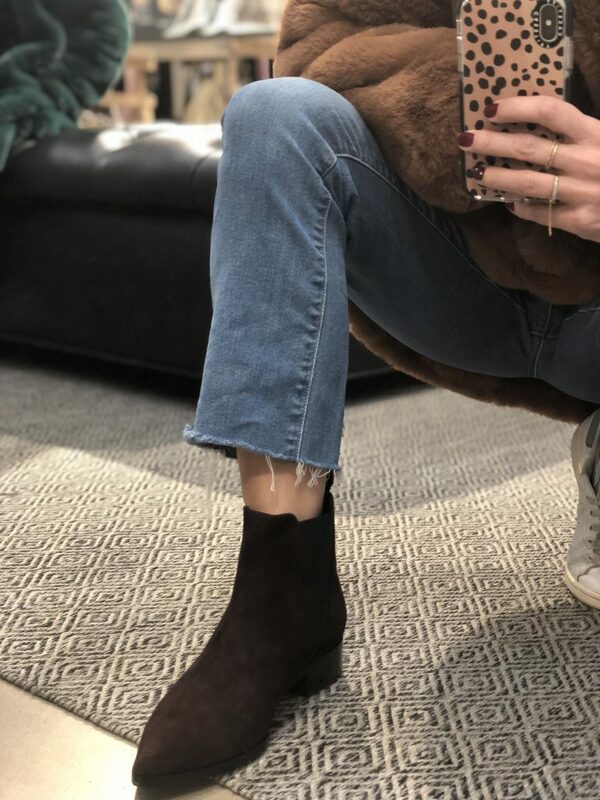 It was out of stock for so long and now it’s back in stock (thanks for the heads up Susie SoSo) I’d wear it with my trainers, my Dune biker boots that I have barely taken off all week, or you could pair it with a smarter style of boot as I have above. The black boots from Arket also come in a beautiful shade of tan. Someone asked me recently if I had seen any and I can’t remember who it was, so I do hope you are reading! If you watch my stories on instagram you’ll know I have barely taken my new Teddy bear coat off this week, even though it hasn’t really been cold enough to wear it. I have been looking for a pair of trousers to wear with the autumnal hues in my wardrobe as I am trying not to wear my jeans as much as I do. 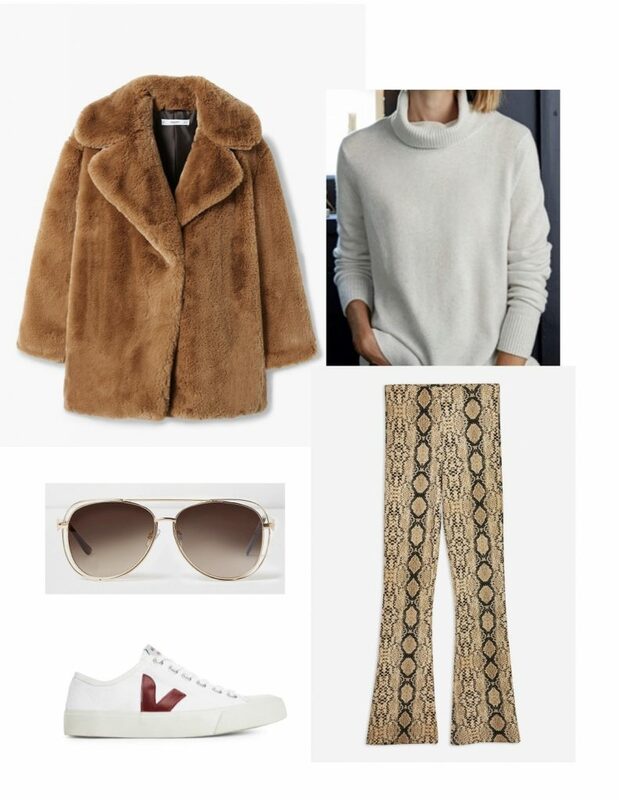 I thought these Topshop Snakeskin flares looked good and would make a change from my more fitted pairs of trousers. 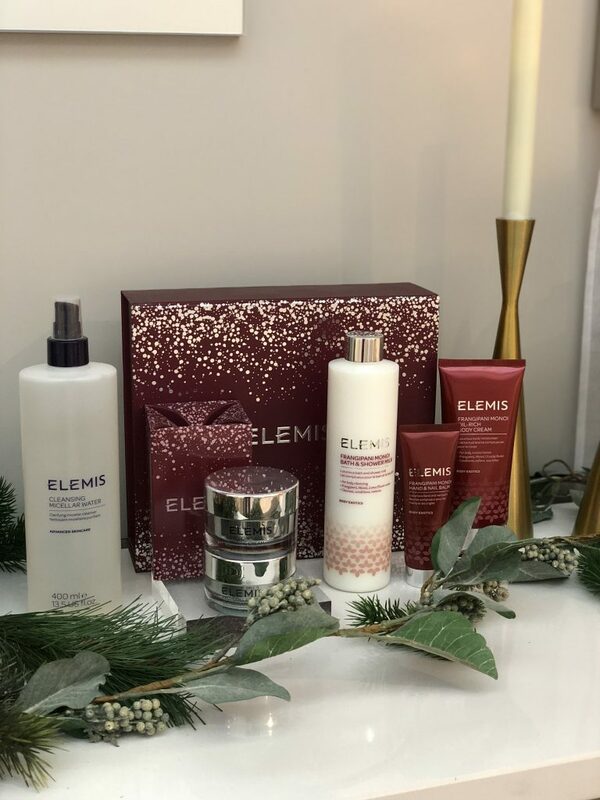 In case you missed it on my stories on Friday, this is a little reminder that QVC are running an amazing offer on Elemis today. I have snapped one up myself as they make such brilliant presents. 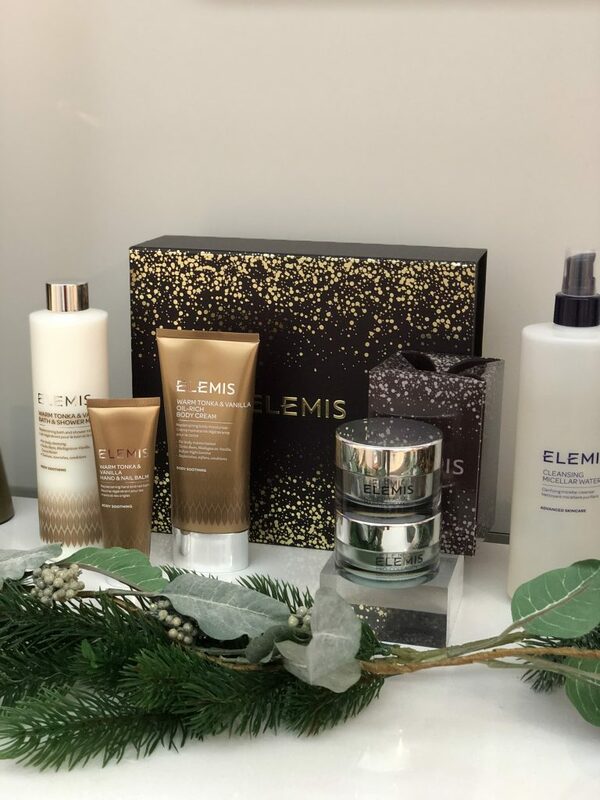 You get all the products above for £46.96 which is less than the price of the Pro-Collagen Marine Cream, which is one of their best sellers. *A great saving: If you were to buy these items individually directly from QVC UK you’d pay £168.30. So to get to get this six-piece collection for our Today’s Special Value price of just £46.96, plus P&P, is an exceptional saving of £115.39. Before I go, I feel the need to get something off my chest…It’s been a week of ups and downs for me. The pesky trolls have been out in force this week and while I am usually quite good at extinguishing them, this week there were just too many to ignore and they have got me down. So I wanted to take this opportunity to be upfront about the reality of this time of year. Influencers are offered more paid collaborations than usual in the run up to Christmas. There are also more invitations to festive events and we are sent more gifts than usual as Christmas approaches. I can fully appreciate that from the outside looking in, it must seem like one big free ride, but the truth is that we do work very hard and most of the hours that we spend answering emails, hundreds of DMS on instagram and creating content are unpaid. I know that most of you reading this will understand and I probably didn’t need to explain, but you’ll also know by now that I am sensitive to how other people perceive me and what I do. It also gives me an opportunity to say thank you to everyone that does understand and still supports me and my blog. I hope you have a lovely Sunday evening. I am really sorry you have received nasty comments. The people who leave them must in their hearts be very unhappy people. You bring a lot of pleasure to your readers. Just try and focus on that. I love that you are real and that your content reflects your tastes so clearly. Stay true to you, which is why I never miss a post!